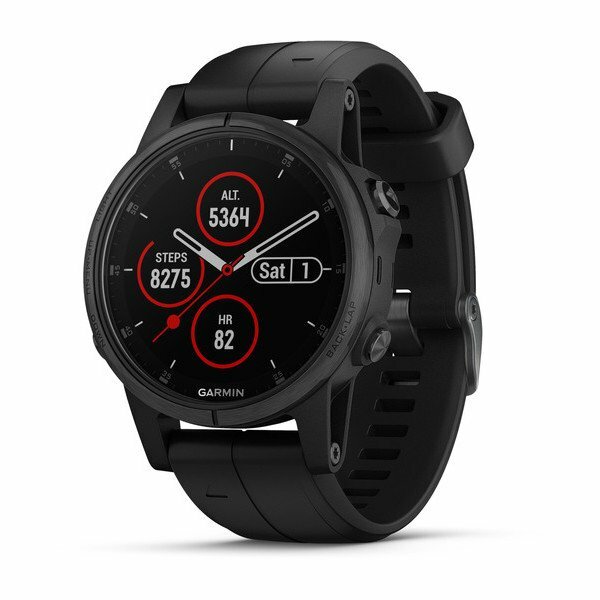 I would still say that the Best Triathlon Watch for serious triathletes remains the Garmin Forerunner 935. It has the tools for the job and comes in a broadly good, lightweight format at a sensible price. But now the Forerunner 935 has a young gun snapping at its heels for that top accolade. So why is the Fenix 5S Plus a contender? The Forerunner 935 and Fenix 5 Plus have the exact same triathlon features. The Forerunner 935 and Fenix 5S/5/5X Plus have the exact same screen size. Yet the diameter of the 5S Plus is smaller. Simply put, the 5S Plus is better for those with smaller wrist or just preferring a smaller format watch – without any loss of actual screen size and quality. This is a MAJOR DECIDING factor for MANY people. But the super serious amongst us will point out that the 935 is a little thinner (flatter) and lighter. How important is that 1.5mm (that’s millimetres not centimetres) difference in flatness and how important is that 16g weight difference? Let’s not forget the stainless steel, all-black or rose gold bezels of the Fenix 5S Plus. Other materials might be supplied as options over the coming months eg titanium (hard/light) or plastic (light) but all we can consider now is the stainless steel (or gold or black) on the 5S Plus which is also the material on the reverse too. The longevity of steel might just give the 5S Plus an edge on the durability front. I’ve dropped my 935 and banged it all over the place and it’s fine. DRAW – I’m not sure that the construction differences have any material functional effect, although commonsense might suggest otherwise. But then we must consider the aesthetics. Let’s take the aesthetics of the band. The Fenix 5S Plus has a QuickFIT band which can be changed in seconds. The 935 can be changed too…but not in seconds. The plastic-nature of the 935 is fine from my personal perspective. But if you want something with a tad more bling then maybe stainless steel or rose gold is your thing ? (ahem) Maybe there will be other prettier options for the future (eg copper or titanium as mentioned earlier). Whilst I’m not impressed with either of them as a ‘formal/dress’ watch I would probably be very slightly more inclined to wear a Fenix 5S Plus with a suit. I have vast amounts of 935 sports data and a fair amount of more recent data with the Fenix 5S Plus. GPS Accuracy – Hand on heart I couldn’t, for certain, distinguish the two and say that one was ‘always more accurate’…whatever that means. Optical HR – So far the Fenix 5S Plus does seem more accurate than the oHR with the 935 when I first got the 935. However since my review of the 935 I have since only very rarely used its oHR. Therefore the algorithms may have improved over the last year and/or the current warm weather might be helping the Elevate sensor peer into my inner physiological workings. GPS+GALILEO Accuracy – They both have Galileo but they probably both have different antennae and probably also a different GPS chip. An all-plastic construction on the 935 may well help with GPS accuracy. So just because they both have Galileo doesn’t mean that they will be the same. It looks like Galileo does make things a bit better SOMETIMES but sometimes not. The jury is out here. So, right now (July 2018), if you want a semblance of predictability then you wont even use Galileo for your tri-training or racing. DRAW – The positional and HR stuff can’t be definitively separated. But the biggie is the battery. Or, in the case of the 5S Plus…the smallie. These are the headline stats. But I’m not convinced you can rely on those. My 935 now sometimes will not last over 10 hours only paired to Di2, power meter and chest strap with 1 second recording over GPS. It should be lasting ‘up to 24 hours’…well. It IS lasting up to 24 hours as 10 is less than 24. Grrrr. The point here being that you need a bit of battery leeway from the official stats to support whatever sensors you are using and taking into account any deterioration of the battery life over time. If the 5S Plus is starting out at 11 hours then I suppose 5 or 6 hours could be a worst-case end-game in a few years time. 6 hours is eating into HIM territory for most people. In that worst-case scenario you would have the option of enabling UltraTrac selectively on your triathlon sports to extend the battery life of a single charge. Forerunner 935 Wins for any intended race distance exceeding Olympic or perhaps if you intend doing a few hilly 100miler rides too. Well the Fenix 5S Plus clearly wins here as it has all the fancy new high-end Garmin features that the 935 totally lacks. Fenix 5S Plus – has all the loveliness of onboard mapping and navigation. There’s a mighty jump in price especially if you go for the bullet-proof titanium/Sapphire glass option. That is enough of a jump for even a gadget-lover like me to think twice. But many of you are not price sensitive. So this won’t be a factor at all. You know what to do. The chances of the 5S Plus being discounted beyond Eu/$/£50 this year I would have thought were very slight unless there is significant over-capacity ie Garmin might have made too many for the real demand at these prices. Whereas the chances of the 935 being discounted are now quite real. Once the 2018 tri season finishes then there could even be a replacement Forerunner 945, either way Cyber Monday will be on us soon enough and this year there MIGHT be some 935 deals. Note: I have seen other comments saying that some of the Garmin watches are not that much more expensive than the Suunto ones (for example). *BUT* very often the person making the comparison is ignoring, for example, the sapphire glass on the Suunto but comparing it to a non-Sapphire Garmin. As you can see from the simple table above, adding sapphire glass notably changes the Garmin price. Someone like me might ‘tut tut’ at others who don’t want a ‘pro tri’ solution. Which is a bit silly really as neither of us are anywhere nears as good as the pro triathletes. Still, it’s good to dream. But also the simple fact is that most of you are not like me (thankfully!!! … I can hear the shouts now 😉 ). We all have different sporting needs. Some subtly different and some notably different. Yet we hopefully share in common our love for our sport and, with that, we just want some gadgets that work and do the job that we want them to – PROPERLY. I guess what I’m saying is that the Fenix 5S Plus probably IS the best ‘techy tri watch‘, it probably is ‘the best tri watch with music‘, it probably is ‘the best tri watch with maps‘ , it probably is ‘the best tri watch with contactless payments‘, it probably is ‘the best tri watch for smaller wrists‘. But it’s probably ‘NOT the best tri watch for an Ironman‘. When I bought the Fenix 5S Plus for myself I half-expected it would replace the 935 much of the time. However, out of all the things I love about it, I discovered I don’t especially like the thinner 20mm band! Even though I have relatively thin wrists I prefer something a bit chunkier overall. That crazy-little reason is why I will mostly stick with the 935. The FR935 is very very comfortable to wear – light, thin and smooth & wide strap. I like the “stealthily” (full black) look of it. The display could be more scratch resistant. f5+ is comfortable and light and thin (not quite as thin) and the width of the strap would be proportionately the same for a smaller-wristed person than you. The stealth look is partly replicated in the sapphire black with black band GBP700…#bargain. your excuse ‘not to’ just boiled down to what I said…thin strap !!! Wrist: I have big hands (and feet), but skinny wrists. Only 17cm in circumference. The FR935 is pretty big for me. The AW3 is perfect in size. The F3(HR) looked and felt like a brick on my wrist. F5S+s: Looks good. But nope, not going to buy one. Too expensive for me (and my needs); not worth the money. I’ll stick with the 935. Please clarify as to whether there is a strap slightly longer that can go on the F5s+? when it will be available for everyone?